When I had first seen that picture, I had thought it made a person’s heart look like a fragile, fragile thing rather than the sturdy muscle I’d learned it to be. Now, I realized it was both. From Amazon: Thirteen is when a Beaumont’s savvy hits—and with one brother who causes hurricanes and another who creates electricity, Mibs Beaumont is eager to see what she gets. But just before the big day, Poppa is in a terrible accident. And now all Mibs wants is a savvy that will save him. In fact, Mibs is so sure she’ll get a powerful savvy that she sneaks a ride to the hospital on a rickety bus with her sibling and the preacher’s kids in tow. After this extraordinary adventure—full of talking tattoos and a kidnapping—not a soul on board will ever be the same. I loved the premise of this book. It is creative and fun and when I started I was looking forward to the adventure. I wasn’t, however, expecting the depth and thoughtfulness that came with it. This is a special book with a whole lot of food for thought wrapped inside a creative story. Positive themes abound including choosing wise voices to listen to, realizing people are more than they appear, and having the courage to stand up for yourself, your family and your friends. Mibs voice is engaging and endearing. Her story is sweet, sad, confusing and poignant, a mix of good and bad all tangled together. This is a brave, standing-up-for-yourself kind of conversation I want my kids to read and learn from. Combine that with interesting characters and an engaging plot-line and you have a book that absolutely deserved the Newbery honor it received. They should consider adding Savvy to their TBR. And, if they love Savvy, Ingrid Law has written two more books in the series. Be sure to check out Scumble and Switch. 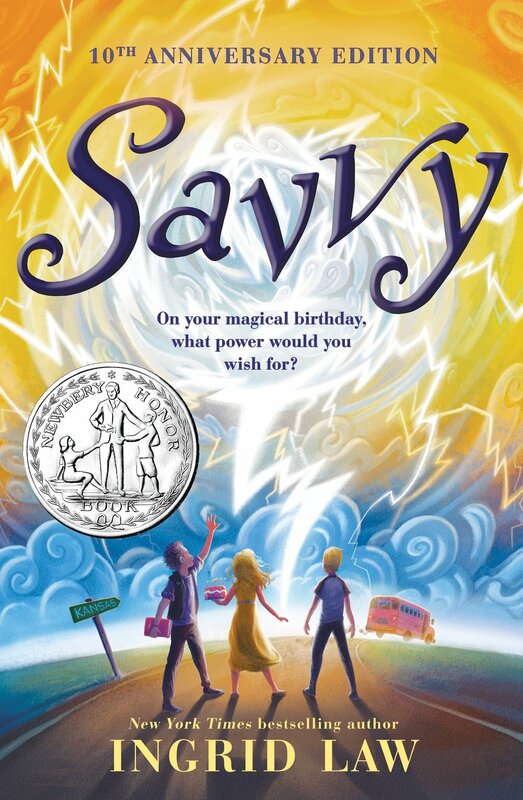 Have you or your kids read Savvy yet? If so, what did you think?